Genetic disorders often have serious implications for the affected individuals and their families. Genetic testing is therefore also a matter of trust in the laboratory’s competence and proficiency. We are committed to providing the highest quality of genetic testing to patients and healthcare professionals. All analyses and processing steps in our lab are performed under controlled and monitored conditions (in conformity with the relevant standards, guidelines and laws) and our services reflect the current state of the art in science and technology. 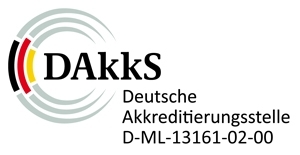 We received accreditation in accordance with DIN EN ISO 15189 for our diagnostic scopes of “Molecular Human Genetics” and “Cytogenetics” by Germany’s national accreditation body, Deutsche Akkreditierungsstelle (DAkkS), initially in January 2013 and again in January 2018, attesting our conformity with all relevant standards and laws.